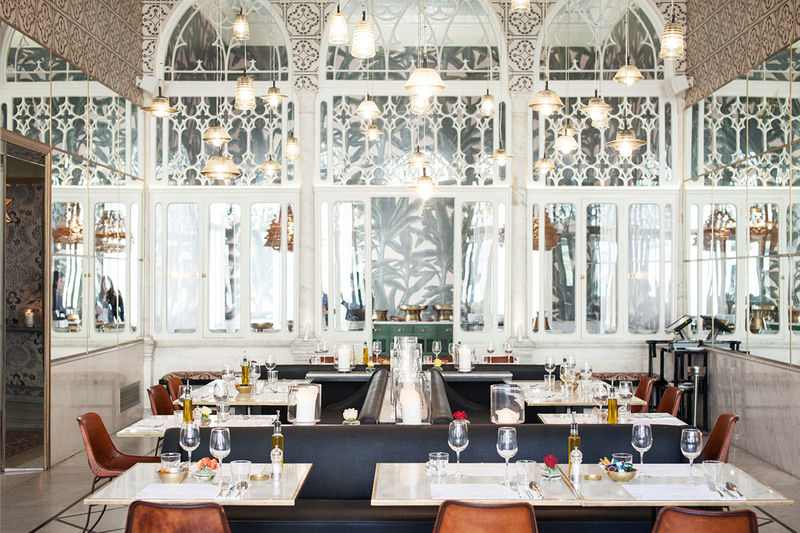 It might seem ironic that when a new Lebanese restaurant, Liza, opened in Beirut, I first heard about it not from local friends or colleagues, but rather, a Berlin based artist (who coincidentally, is married to a Lebanese), when she raved about the design of the place. Set on the top floor of a refurbished, 500 square meter 19th century villa (above the Metropolitan Art Society), Liza’s design transformed what could have simply been a grand, ornate space into something with an ultra contemporary flair, though no less impressive. 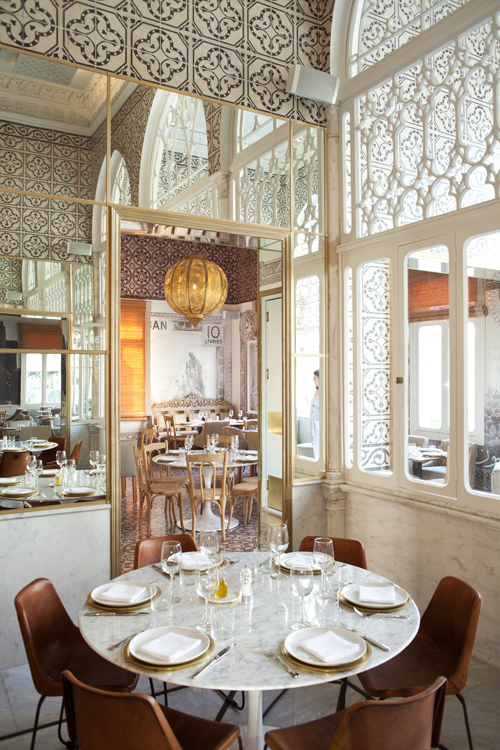 Floor-to-ceiling arched windows serve as partitions and passageways in the lofty, light flooded interior; the custom made wallpaper patterns are like stunning modernist frescoes — large banana leaves in one room, an interpretation of Beirut cityscapes in another, and blown up ancient Lebanese lira notes in a third. Hanging from the ceiling, you will find everything from three dimensional gold stars to a flying elephant. “You know, it’s crazy but our biggest budget was for the lighting,” Liza Asseily tells me, laughing. 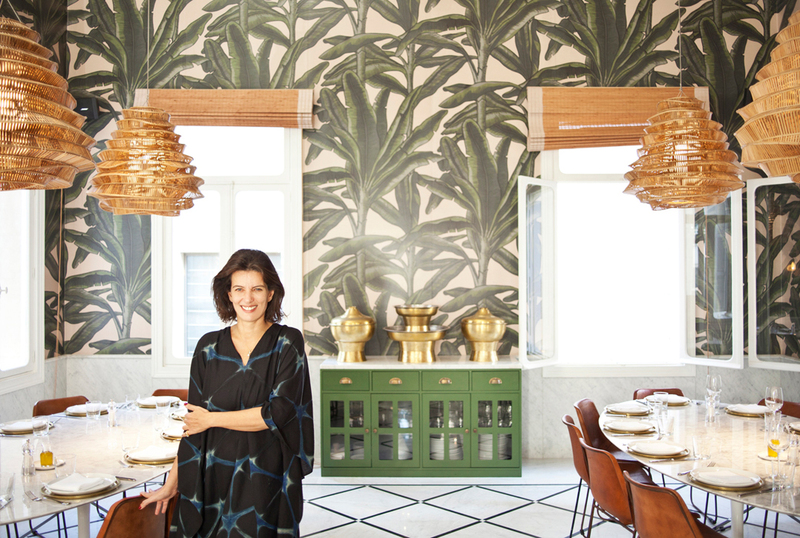 She is the co-owner of her namesake restaurant in Paris (which opened in 2005), along with her husband, and now, the new Liza in Beirut, which opened a year and a half ago. 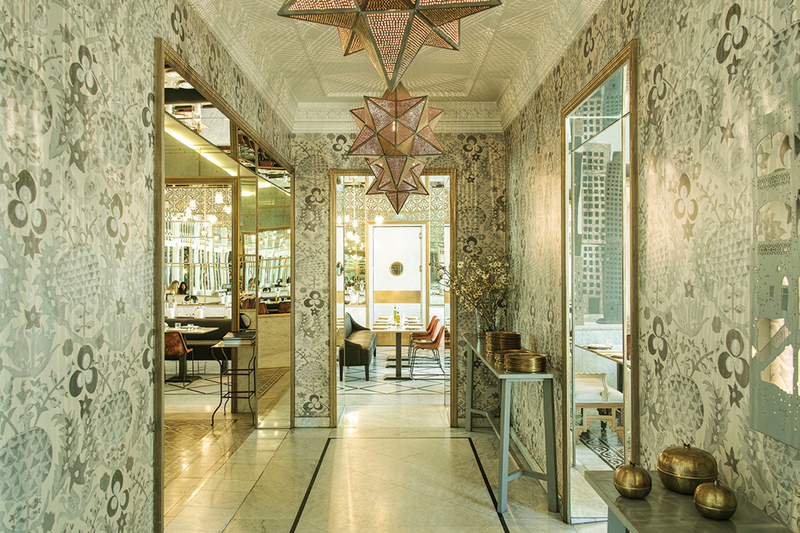 “We’ve even got some Tom Dixon here and the star shaped lights are Hubert Fattal,” she says as we drink mastic-infused lemonade, one of Liza’s concoctions. When it came to picking the location of their first Liza 10 years ago, the way they positioned the restaurant was a crucial factor for them to consider. “We didn’t want it to be next to the usual 8th arrondissement or the 16th and the Champs-Élysées, but on the second, next to the Palais-Royal. At the time, no one else was there, so we were pioneers in a way.” Asseily basically went with the first place she saw (she had a feeling about it), a fabulous 1920s building, relatively inexpensive, which now also has an adjoining Liza bakery. In 2011, they were asked to set up a temporary, pop up space in Galeries Lafayette, which became so successful that six months ago, it was made into a permanent one. Yet the main arm of the business is actually catering (Liza Chez Vous) and they work for high end fashion brands, such as Lanvin, Kenzo and Chanel, among others. Despite their popularity in Paris for the past decade, Asseily confesses, “We always wanted to bring Liza home and in the back of Ziad’s head, he wanted to do it in this fantastic old Lebanese house.” Once again, they were lucky with their new address when Chafic el Khazen — the CEO of Sky Management — who became their partner for the Beirut venture, discovered this palatial mansion in Ashrafieh, originally owned by the first governor (of what was Greater Lebanon at the time) and then by the Bustros family. Bringing Liza home was not without its challenges however. The Lebanese community, as compared to the French, isn’t as easily satisfied when it comes to their national food. “In France, we could have more liberty since many people don’t really know Lebanese food, if they aren’t originally from here. Even though my husband loves to cook and we designed our menu with a Lebanese consultant who trained the French chef, we wanted to look at how Lebanese eat today. So it was a risky approach from the very beginning.” Risky, because Liza takes an unusual, creative spin on culinary heritage. “For example, I would have people coming up to me here, saying, you have no right to call this hummus when it has cumin in it and not tahineh!” (Interestingly though, the criticism must have had some impact because Liza names this particular dish as hummus balila and not just hummus, since it is primarily chickpea based and without the usual sesame paste). Liza’s innovative take on Lebanese cuisine extends to meals like daoud bacha, which is served with bulgur wheat instead of rice. And the overall presentation may not be generous in quantity (it’s presented in smaller amounts than what is customary in our part of the world) but the food is ‘generous’ in its wide ranging tastes, and the combination of different palates offered. Whether it’s the daoud bacha, which has meatballs with a tinge of pomegranate set against smoky, fried onions, or oven baked cauliflower salad doused in sesame paste, the flavors all seem to have a tang from something added that diverges from the norm, like an unusual spice or an ingredient that doesn’t normally come with a particular dish. But this is not to say you won’t find the usual suspects. The fattit batinjein for example, an eggplant dish with yogurt, pine nuts and fried bread was crispy, saucy and cooked to perfection. They are also well known for their lamb shank with spiced rice and dried fruits (kharouf bi khams bharrat). 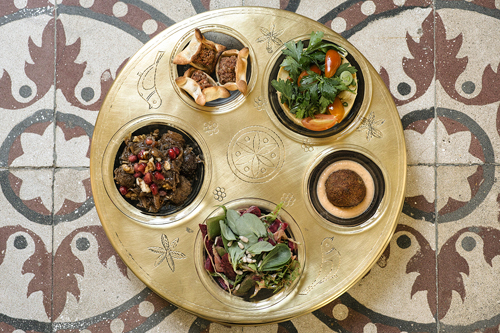 As for mezze, Liza does it distinctively, in the form of a lunch tray option, beautifully designed by Karen Chekerdjian with concentric circles for the small portions. You have different choices, among them a vegetarian one that’s both gluten and lactose free — which Asseily says is part of how they want to cater to the modern lifestyle, by offering food that is wholesome and light. You can see this clearly with their desserts too. Though I’m not at all a fan of Arabic sweets, Liza’s weren’t heavy with syrup and clotted cream (ashta). Their milk custard (haytalieh) with orange blossom and homemade blueberry coulis, or Ghandour biscuits with rose ice cream or their halvah ice cream with carob molasses and pistachio, were inventive — sweet, but not over the top. If we were to play devil’s advocate here, we would ask whether ‘authentic’ Lebanese food can really be made contemporary when we don’t have the equivalent of haute cuisine (and the experimentations that come with it) and if it doesn’t follow then that when you mix two different genres together, you are bound to fall short on one. Liza definitely pushes the boundaries, yet without subscribing either completely to the traditional, nor completely to the modern, you have something in between. Still, as their approach to food demonstrates, this doesn’t mean you completely lose the essence.